The weather seems to be good with us these days, without question. 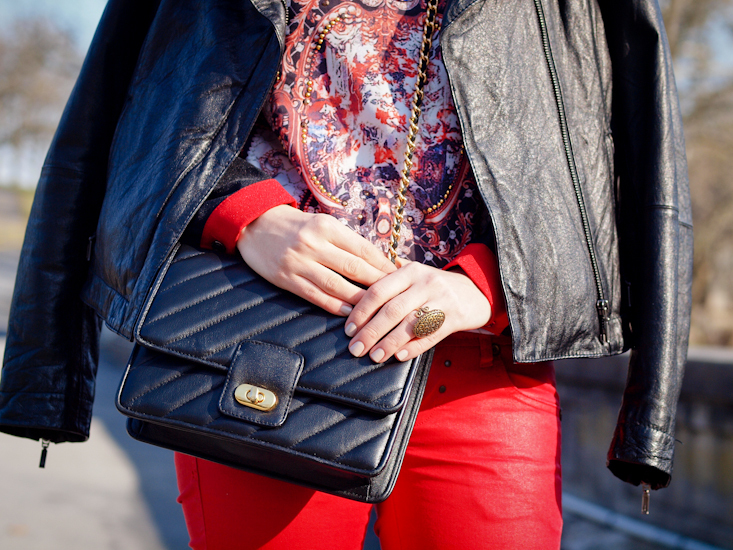 For that matter the leather jacket made a comeback into my outfits and also the red color. So today I have a black & red combo, spiced up by this printed blouse. The whole look seems to be a little bit rocky, a little bit Balmain, don't you think? Adorable look, dear! Love, love your style! You look really cool, love the outfit. great outfit! and the top is so cute! You look great…love the red!! red is your color!!!! and definitely rocker and balmain……LOVEEEEE this look! amazing prints on your top! the blouse looks so good! ohh I just followed u.